Okay, if you are anything like us, you will need a little bit of a cheat treat during the six week challenge. These cranberry oatmeal bars have been further reinvented from a fitness website recipe. They are delicious and will satisfy your need for a treat. To make sure we don’t eat the whole batch at once, we freeze half the recipe and just pull one or two out for that special occasion! We have changed up a few of the ingredients to reduce the refined sugars, butter, and sour cream. 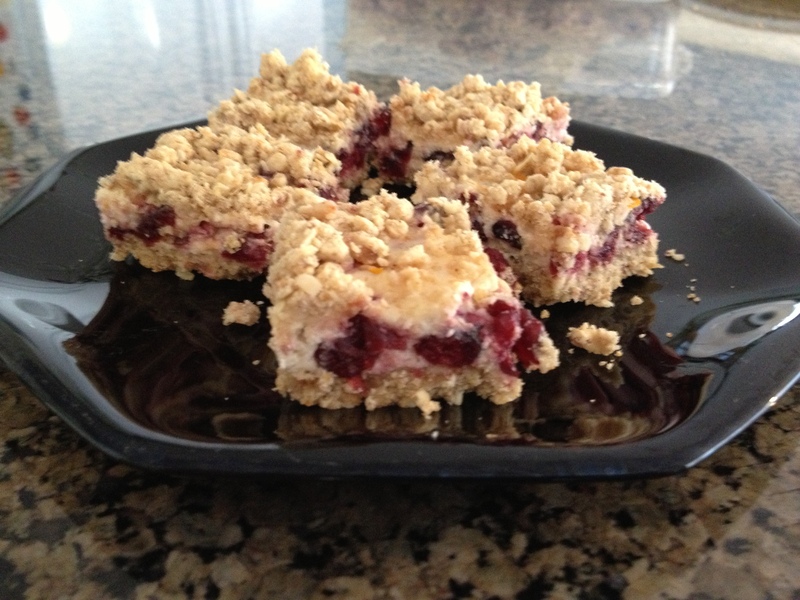 The original recipe can be found at http://www.fitness.com/recipes/763/cranberry_oatmeal_bars.php. Using a food processor, grind the dates until ball forms. To prepare crust, combine the ground dates with flour, oats, salt, baking soda, and cinnamon and using your fingers work the dates into the mixture so that it forms a crumbly mixture. Drizzle the melted coconut oil and orange juice into the mixture and stir until moistened. The mixture will remain crumbly. Reserve about 1/2 cup of the crumbly mixture and press the remaining mixture into an 11×7 inch prepared baking dish. To prepare filling, combine cranberries, yogurt, maple syrup, flour, vanilla extract, orange rind, and egg white in a medium bowl, stirring well. Spread cranberry mixture over prepared crust and sprinkle reserved crumble mixture over top of cranberry filling. Bake at 325 degrees for 40 minutes or until edges are golden. Cool completely in pan and then cut into 24 squares. Alternative: Substitute dried cherries for the cranberries and lemon rind for the orange rind in filling.